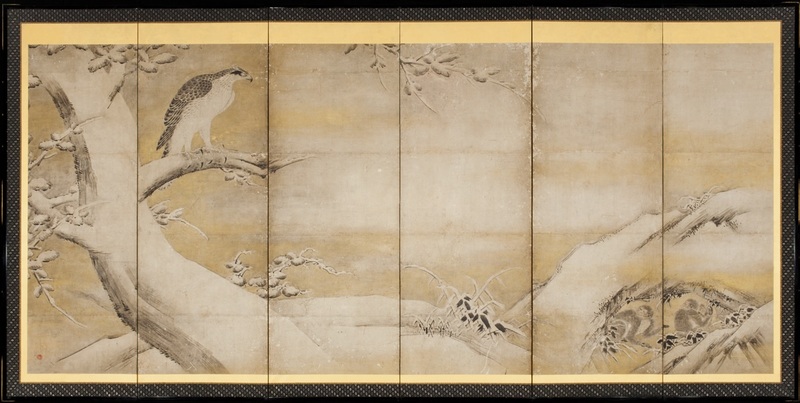 This screen was created by a member of a school of painters that traces its origins to the fifteenth century and the beginning of ink painting in Japan. Both the emphasis on the foreground and the powerful brushwork identify it with someone working in the circle of Kano Sanraku in the Keicho era (1596-1614). Linked to the patronage of the military class and under the leadership of great artists such as Motonobu and Eitoku, Kano school artists invented a vital style associated with a corpus of themes. The proud, fierce falcon here is heroic in spirit, evoking the ethos of the samurai class; the use of vacant space in an expansive setting dramatizes the conception. Falcon on Oak Tree was originally the left-hand screen of a pair. The right one, known only through a photograph, depicted an eagle catching a rabbit.